At the moment the Arsenal are simply riding the crest of a wave. I’m just going to enjoy it for as long as it lasts. Last night Coventry came to town for the Capital One Cup and Arsene Wenger chose a team with the right mixture of youth and experience. The final result of 6-1 was testament to the hunger of the younger players to impress and the hunger of the more established players to stake a claim for a starting spot on Saturday. Olivier Giroud started in what can only be seen as a confidence game for the striker. He indeed boosted his confidence with a quality dink over the keeper to open the scoring on the night and settle the nerves of the team in the first half. It was important the striker got his goal yesterday, considering the score line you would expect your forwards to hit the back of the net in the goal rush. I think what was also important was the fact he scored from open play, a set piece goal from a penalty doesn’t quite banish the demons and it was great to see him finish so calmly in open play. His penalty miss in the game is less damaging due to him scoring earlier; he was unfortunate not to score as it was a well taken penalty but when the keeper guesses the right way these things happen. Let’s hope Mr Giroud can now kick on this season. Theo Walcott was given an opportunity to play up front and back up all the talking he has done this week about his desire to play in that role. Theo has admitted he would like to be a legend like Thierry Henry at Arsenal and believes this can only be achieved as a striker. Wenger duly obliged and called his bluff by selecting him in his preferred role. I have to admit after a mixed first half where everything wasn’t coming off Theo exploded into life in the second half and was rewarded with two quality finishes that were almost trademark Thierry goals. Definitely food for thought for Arsene, Walcott rose to the task and answered his doubters. Great for him but now the next step is to produce similar performances and goals against better opposition. That is probably one of the greatest criticisms of Theo is in the bigger games when you need the big players to stand up and fight he is usually anonymous. He is still young but the consistency is what he really needs to add to his game for people to take notice. Andrei Arshavin seemed to have a lot of fun on the night, he played in a more central playmaker role without the added burden of protecting the flanks and it was clear he relished the role. It was reminiscent of his performances for Russia in the euros the way he was direct, spraying balls around and being a general nuisance to the Coventry backline. I noted yesterday that he needed to make the most of his opportunities in this game to force his way into Arsene’s plans in the premiership games. He surely did make the most of it and chipped in with a goal and assist in the game. This is the kind of performance the arsenal fans expect from the Russian and we know he can do it against better opposition too. Maybe Wenger will consider him in that role in future, he deserves a chance there as an option to alleviate the burden on Santi Cazorla to produce week in week out. It’s nice to know we have another player who can play in that hole effectively. Arshavin when he’s in the mood is a player to fear, let’s just hope he can maintain the hunger. Alex Oxlade Chamberlain just loves this competition; it was around this time last year that he announced his potential to the arsenal fans with a barn storming performance against Shrewsbury. He was clearly in the mood yesterday and had a great game against Coventry. Always direct, he pulled off a few flicks and tricks and was a constant thorn in the Coventry side. He topped it off with a finish that had the whole stadium jumping. A real quality strike from outside the box, hardly any back lift in the shot it cannoned into the top corner of the net and set the game up nicely for the 6-1 outcome. The timing of the goal was perfect as Giroud had just missed his penalty and it could have had a negative effect on the team and raised Coventry’s hopes. The Ox’s bullet of a goal banished any hopes Coventry had and merely added to the already exponentially rising stock he has. It really is exciting when you look at the abundance of options we have in midfield at the moment. Of the younger players that were drafted into the team Dami Martinez had a very good debut, despite the lack of pressure from Coventry he did everything that was required of him when called upon. His kicking was good, his claiming of the ball and he pulled of a couple acrobatic saves. He couldn’t be faulted for the goal and yesterdays experience would have done him a world of good. Martin Angha came into the side for his debut at right back and didn’t looked overawed by the occasion, he seemed very comfortable in that role and future is looking good for the young Swiss. His final delivery from the flanks may need a bit of working on but there are enough signs last night he the potential to be a future arsenal first team player. Nico Yennaris came into the side and was drafted into midfield, a position he plays quite a bit in reserves and he certainly had a good game in the middle of the park. 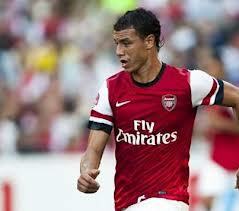 Versatility is an attribute Arsene loves and he certainly showed Wenger he can play there if called upon. The only thing against him is his size but he has plenty of time to fill out and muscle up. Ignasi Miguel continued his development with an assured performance alongside skipper for the day Johan Djourou. He even chipped in with a headed goal and put himself in the shop window for a potential loan move to further his development. Serge Gnarby came on for Oxlade-Chamberlain in the second half and looked an almost carbon copy of our England midfielder. He is certainly another player off the production line that will excite the fans; he had a couple decent runs at the defence and came so close with a rocket of an effort. It was nice to see Emmanuel Frimpong get on the pitch, he received a very warm reception from the fans when warming up and when he eventually got on the pitch. It has been a long journey back for the midfielder and now I hope the knee injuries can be a thing of the past. It really does seem like there’s no more room left at the inn but with Jack Wilshere and Thomas Rosicky still to return we really are spoilt for choice at the moment. Arsene I really don’t envy you right now as someone has to miss out each week and nobody at the moment is giving you a reason for them to be ignored. We drew Reading in the next round of the cup, a shame its an away tie but cannot complain as we could have drawn far tougher opposition. Next up for Arsenal is the visit of Coventry city in the Capital One Cup. Not sure about the name of the tournament, it just doesn’t quite flow off the tongue either way it’s a trophy on offer and so I’d like our boys to have their name etched onto it. Given the good feeling from the game against Man City it is hoped the momentum can be carried on from our younger more fringe players in the squad. At the time of writing this post the squad for the game hasn’t been released yet however given the shots on the official website of the team training for the game it is clear there will be a mixture of youthful potential and more experienced professionals. The likes of Nico Yennaris, Tom Eisfeld, Serge Gnarby and Dami Martinez will be joined in the squad by the likes of Johan Djourou, Andrei Arshavin and possibly Olivier Giroud. I suppose when you consider how well the first team has been doing Arsene hasn’t been afforded the luxury of changing the team around and this has led to many players not getting a sniff of action so far this season. When you have a winning team you don’t tend to tinker too much and so there have been casualties in the likes of Johan Djourou, Maroune Chamakh and Andrei Arshavin. The game today is a chance for them to put themselves back into Arsene Wenger’s plans and give him a headache ahead of the London derby against Chelsea on Saturday. At present Andrei Arshavin seems almost frozen out of the picture, surprising given the fact he did not move on in the last transfer window. I still feel he can play a big part in this season, with a new focus and drive it’s possible. The difference this season is there are plenty options ahead of him so any sign of laziness and he’s back in the stands. The competition may ignite him to the level we all know he is capable of, tonight could be the start of showing us that. Johan Djourou is another player who was heavily linked with a departure from the emirates over the summer. The player went public to deny he was leaving however his national manager made him aware of the fact his lack of playing time will effect his opportunities for Switzerland. At present it’s not looking good for Djourou, always regarded as the 4th choice centre back his opportunities will come when any of the first three start slipping in their standards. Vermaelen, Koscielny and Mertesacker are currently playing out of their skin and so Johan will have to make do with today’s game to play first team football and maintain some match sharpness. He will get chances over the coming season I just hope he is patient enough to wait for his chance. Maroune Chamakh seems to have disappeared off the planet; today could be a chance to him to show his determination to still make it at arsenal. His opportunities have been heavily reduced due to the acquisition of Giroud and Poldolski and Arsene offering the opportunity of central roles to Gervinho and Walcott. Chamakh is not adaptable to play anywhere else in the team apart from central striker and that perhaps hinders his favorability with Wenger. The interchanging between the front players has been one of the strong points of our team this season and restricted chances for the striker and even Giroud to a certain extent. I guess our forward combinations are also dependant on the opposition we face and at present new boy Giroud is the preferred option when an out and out striker is required. Until our French striker finds the net this season Chamkah can take any opportunity that comes his way to push him ahead in the pecking order. I have a slight inkling that Wenger may pair Chamakh and Giroud up front together in a slightly changed formation. This is just a guess mind you, I have no inside knowledge I just feel the game against Coventry could be a chance for Wenger to look at a plan B. We may see the return of Emmanuel Frimpong in some capacity today, the league cup games have always been used as an opportunity for Arsene to bed in players returning from injury. He probably won’t be risked from the start but I would not be surprised to see him on the bench. It’s probably a bit too soon for Wilshere despite him returning to full training but Frimpong is ahead of our no.10 in the recovery stakes and hasn’t been out of the game as long as him. It will be a welcome return for the powerful midfielder and another stepping stone for him to work his way back to where he was at last season. A cameo appearance is not out of the question. One player we may also see tonight is Craig Eastmond, remember him? After bursting onto the scene a few seasons back the midfielder’s development has stalled drastically. A couple of loan moves have failed to push him on in his development. This season is make or break for him and to see the likes of Henri Lansbury move on it is clear that he really needs to work hard and take his chances or he will be out the door. I understand he has played a few reserve games in defence this season and it is this kind of versatility that may make him useful to Arsene. Although he was converted from right back to central midfielder initially, his potential as a utility player is not a bad thing. I will be interested to see if he is involved and where he plays. I’m looking forward to tonight’s game; I’ll be down there as I can never turn down the opportunity of £10 tickets. It’s a different atmosphere than league games but it a chance to go to games with family and friends that don’t normally get the chance. I always enjoy seeing the next generation of players and how they get on in these games against better opposition than reserve level teams. I suppose I am getting ahead of myself by expecting us to beat Coventry today, they will be no mugs and we still have to turn up and perform to get the result. Here’s hoping for a good run in this competition starting from today and lots of home ties in future rounds. 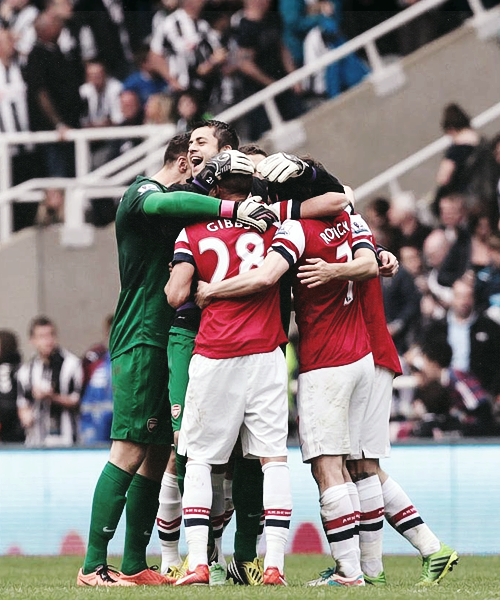 Good luck Gunners.